Roy was born in Maynardsville, TN in 1907. Roy got a violin for 25 dollars that took him away from a baseball career it was said. Roy began his radio career in Knoxville, TN. Over seven years at WSM, Roy and his Smoky Mountain Boys rose to the top in their type of "old-time music". 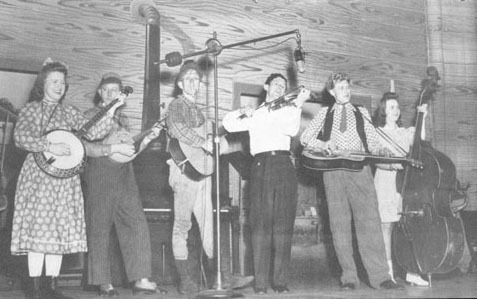 Lonnie Wilson, featured in jug band as is comedy character, "Pap"
The boys were featured in the the Republic picture "Grand Ole Opry". 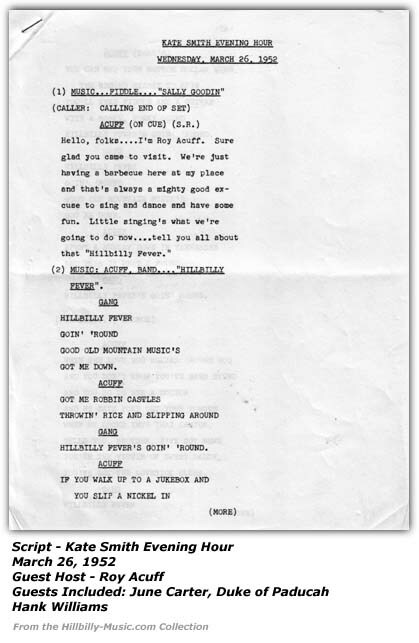 They were also features of the Grand Ole Opry Tent Show one summer and travelled thousands of miles and played personal apearnces to many thousands of people. But no matter where they played, it was back to Nashville on Saturday night where on the Grand Ole Opry were the featured act of the Prince Albert Network half hour for the R.J. Reynolds Tobacco company of Winston-Salem, NC. going to do now....tell you all about that "Hillbilly Fever." (2) MUSIC: ACUFF, BAND..."HILLBILLY FEVER". YOU'VE GOT THE LOVESICK BLUES. GOT A SHINE, AND I HEARD THIS SOUND. FOOT DRAG AND THEN HOE IT DOWN. out....I'm as hoarse as can be. Well, how'd that happen, June? June, honey - that was a foxhole. Roy, a fox mights dug that hole, but that sure wuz a wolf in it! Now you stop your foolishness and sing for us. Folks, this is June Carter. I GOT TO THINKIN' IT OVER. IT'S A MIGHT LONG WAY. ....the Cedar Hill Square Dancers. June, honey - you were having some trouble there, weren't you? I've got just the partner for you. Hank Williams. I'm going to do for you "Hey Good Lookin'". (8) MUSIC: WILLIAMS ... "HEY GOOD LOOKIN'". HOW'S ABOUT COOKIN' SOMETHING UP WITH ME. SO HOW'S ABOUT SAVIN' ALL YOUR TIME FOR ME. HOW'S ABOUT KEEPIN' STEADY COMPANY. coming in here who always says -- "Those Shoes Are killing Me". The Duke of Paducah! (10) DUKE: ENTER LEFT, MAKING FUSS. BACK TO THE WAGON...THESE SHOES ARE KILLIN' ME". a llittle jug band music here. BUT NOW I'M LUCKY IF I JUMP AN INCH. NOW ALL THEY SAY IS "YOU MAKE ME SICK". we all enjoy singing together. Looks like we have to say goodbye. In the later years of his life, Roy lived in a house on the Opryland grounds and was a fixture of the Grand Ole Opry if there ever was one. From Roy Acuff's WSM Grand Ole Opry Song Favorites. 2385 A What Will I Do? 2460 A Is It Love Or Is It Lies? 20169 A Are You Thinking Of Me, Darling? 20378 B Do You Wonder Why? 37442 A Are You Thinking Of Me Darling? 37943 B Do You Wonder Why? 9170 B What Would You Do With Gabriel's Trumpet? 9671 B Will The Circle Be Unbroken? 9740 A Fly, Birdie, Fly! 9809 A Are You Thinking Of Me Darling? 05093 B Fly, Birdie, Fly!